At a press conference today in D.C., Musk said that he has filed a suit to open up competition on a three-launch contract with the U.S. Air Force while announcing the successful soft landing of the Falcon 9 booster rocket. It’s entirely possible that Elon Musk is just the kind of guy who finds trouble wherever he goes. Today, the Tesla/SpaceX CEO announced that his company will file suit with the Court of Federal Claims in order to block the United Launch Alliance (ULA) from receiving a contract from the U.S. Air Force to launch military security satellites. Musk’s contention is that SpaceX’s offer was not even so much as considered, despite the fact that they can perform the same services as the ULA for a fraction of the cost. Back in December, the U.S. Air Force awarded the ULA three contracts with the sum total of more than $3 billion. Musk contends that SpaceX’s costs for launch are considerably less than that of the ULA—which is a company run by Boeing and Lockheed Maratin. Musk also questioned awarding the ULA the contract on the basis of their Atlas V rockets using Russian RD-180 engines. Musk contends that rewarding Russia with a contract for rocket engines wouldn’t make much sense in light of their actions in Ukraine. It wasn’t all doom and suits for SpaceX at the conference, however: Musk also announced that the company has successfully landed the Falcon 9 rocket that it launched last week. The Falcon 9 is said to have landed safely in the Atlantic Ocean last week, though it was destroyed by wave activity before it could be retrieved. 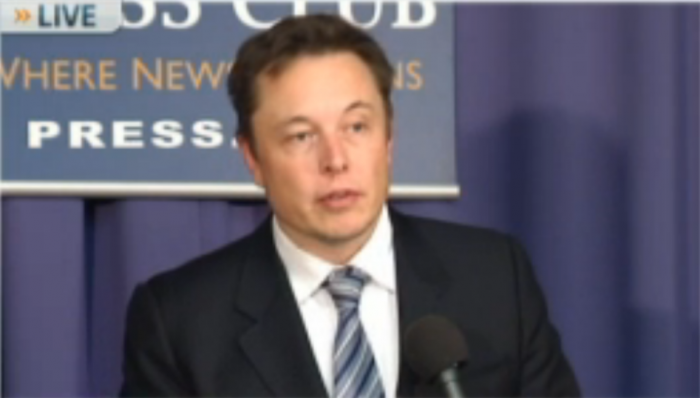 Musk stated that the next goal for SpaceX will be to land a booster stage rocket on land.